Enjoy Free S/H (within the US lower 48 states only) for this cape! In Morocco, this beautiful piece is called Burnoose or Selham. It is made in Morocco from a nice soft blend of wool and cotton. This Burnoose also has a hood with an elegant tassel. The Burnoose is worn by both Imazighen (Berbers) and Arabs. 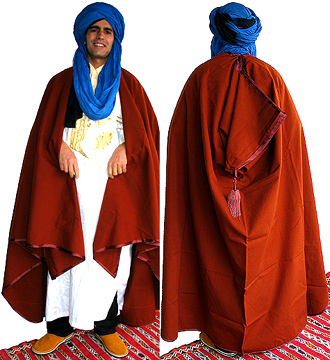 This garment is traditionally worn on a long garment such as a Moroccan hooded jellaba or a white Saharan gandora or robe as you can see on the image. It could be worn by just putting it over the shoulders without having the head go through the neck opening or you can put the head through the neck opening especially if you want to use the hood, the cape would still drape over the shoulders. The Moroccan Burnoose is a garment for any occasion. You can still wear the burnoose over regular clothes if you want and will look great! A great thing about This Burnoose is that it would fit any size. 102” across X 60” H and the hood is 14” Sq. Get a turban with your cape! They go well together. Also, don’t forget to shop for a gandora or jellaba garment to wear underneath the Burnoose. Dry clean or hand wash and fresh air dry when needed.